The minimum order for quantity pricing is 20 bracelets, which may be mixed styles. All Opera Bracelets are individually handmade. Email cindy@operabracelets.com to inquire about time needed to fill quantity orders. I will do everything possible to meet your deadlines. Also email me for a quote if you need a quantity larger than 50. Please Note: If you are interested in placing a custom/special order bracelet in quantity, there is a one time design fee and then the prices follow as outlined below. Please see the Special Orders page for information on design fees. 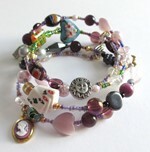 "Full Story" Opera Bracelets: Wrap around the wrist approximately 4 times and include many meaningful beads and charms. A story chart explaining the symbolism of the beads accompanies the bracelets. Mixed varieties of bracelets are allowed (Example: 5 La Boheme, 5 La Traviata, 5 Carmen, etc. ).Quantity price for 20 or more bracelets: $48.00 each (Suggested Retail, $96.00 each). 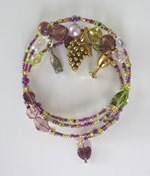 "Inspired by..." Style Bracelets: Wrap around the wrist approximately 3 times, utilize a few larger beads, 3 charms and include cards explaining the bracelets' meaning. Mixed varieties of bracelets are allowed (Example: 5 Brindisi, 5 Toreador, 5 Forest Murmurs, etc.). Quantity Price for 20 or more bracelets: $24.00 each (Suggested Retail $48.00 each).